Often times at Windows, Doors & More, we get to be a part of some big, beautiful, and amazing homes, many of which are showcased here on our website. However, since windows and doors are an integral and important aspect to ANY size home, we just love to see the variety of sizes, functions, and styles we come across! From winter cabin retreats, to tree house escapes, and backyard yoga studios; you name it, we've probably done it. With all the projects we are honored to be a part of, homes with a sense of philanthropy, community, and giving back are a big priority to our company motto and efforts. This Partner Blog with Weber Thompson Architects, reminds us why we do what we do. To provide homes with aesthetic and functional connection of interiors and exteriors, in all shapes, sizes, and ranges. For the project WT undertook, we supplied windows and a door to help contribute to a good cause, near and dear to our vision of community and connecting people with spaces. 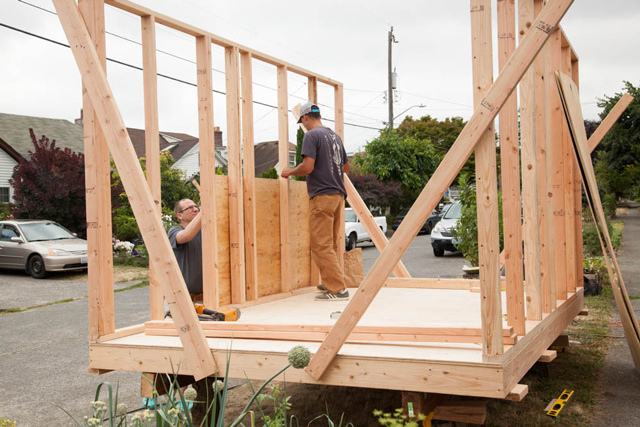 Much like the shelter homes we have donated to in the past, with Sawhorse Revolution and Rebuilding Together, two Seattle area non-profit organizations, this home by the folks at WT is an important contribution to our society. We are happy to contribute where we can, and are thankful to be asked to join efforts within our local building industry! 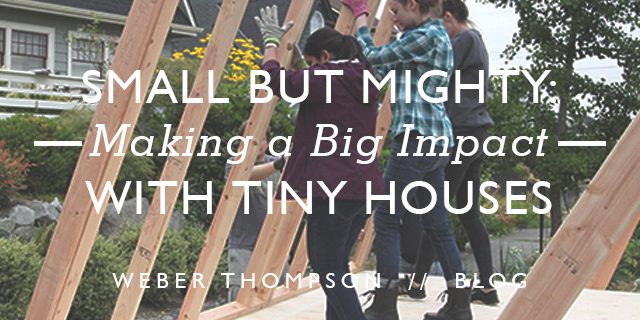 A BIG thank you to the team at Weber Thompson for an insightful, thought provoking, and fun article SMALL BUT MIGHTY: Making a Big Impact With Tiny Homes. And for creating spaces for people to live and thrive in our community. We are glad we were able to be a small, but mighty, part of what you do. As Architects and designers in Seattle, we see how a demand for housing in our city is affecting cost and availability, and contributing to an increase in homelessness. According to the 2016 “One Night Count” there were 10,047 people homeless in King County on January 29th, 2016, and 4,505 without shelter (statistics that are widely considered undercounts). Weber Thompson cares deeply about community, and as people who design shelter for a living, we asked ourselves, “What more can we do to help with this issue?” When we learned about the Low Income Housing Institute’s (LIHI) Tiny House work, we were inspired by their program and jumped at the chance to become more involved. LIHI is dedicated to serving a wide variety of populations through a number of programs, including the operation of four (and growing) homeless encampments across the city for sheltering homeless families and individuals. LIHI’s encampments offer an improvement over the conditions of non-regulated encampments by providing safe and secure temporary housing, with access to services that can help homeless residents work to secure more permanent housing. LIHI’s village encampments are democratic and self-managed, have strict codes of conduct, include resident background checks, and work with communities to conscientiously integrate encampments into neighborhoods across the city. LIHI’s villages provide space for tent shelters and also Tiny Houses. Tiny Houses are small, simple, sturdy sleeping structures. The structures have an open floor plan of about 8’x12’, a window, a lockable door, and may provide shelter for individuals, couples and families of up to four. The structures do not typically include power or water; these services are provided on site as a shared resource. Likewise, a common kitchen is used by residents for meals, as the tiny houses have no cooking facilities. 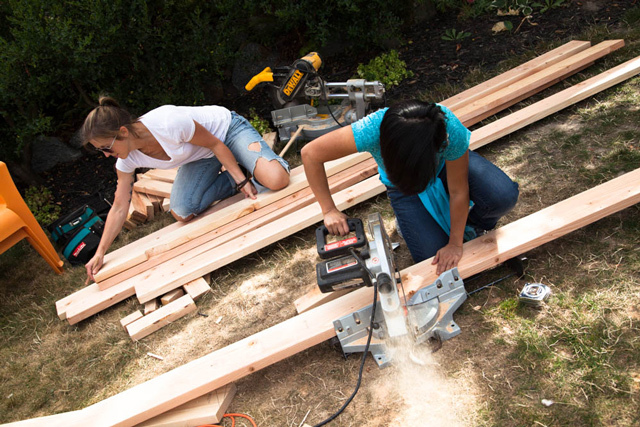 LIHI already offers Tiny House assembly instructions (available to any community group interested in providing a unit) and Weber Thompson saw an opportunity to utilize our design skill sets to build upon LIHI’s Tiny House prototype. We kicked off our research by visiting the grand opening of LIHI’s Othello Village. WT’s staff and partners spent time visiting with residents and LIHI staff having in-depth discussions about what the residents really need and value in these shelters. From there, we set our prototype improvement goals. 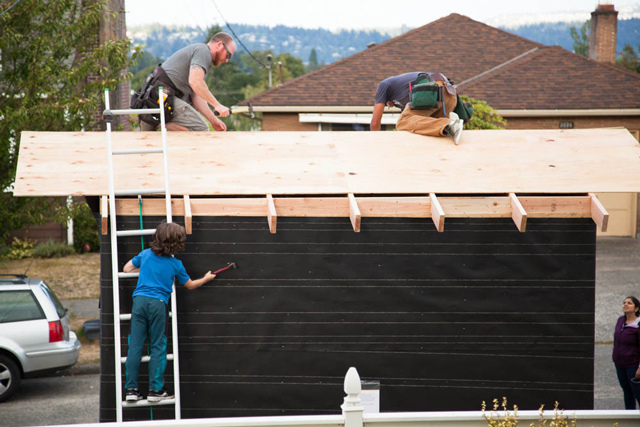 In order to better meet these goals, our Tiny House also includes an interior sleeping loft, an additional window and improved ventilation, insulation and weatherproofing details. 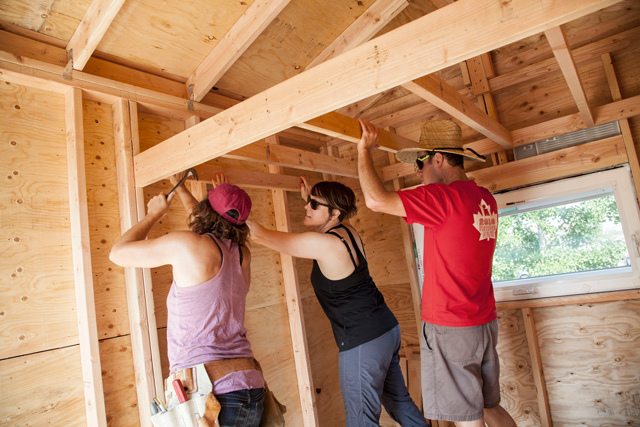 To make our Tiny House design a reality, the ownership of Weber Thompson generously donated the staffing hours and purchased materials to design and manage the construction project. Several vendors that work closely with our office made generous material donations. 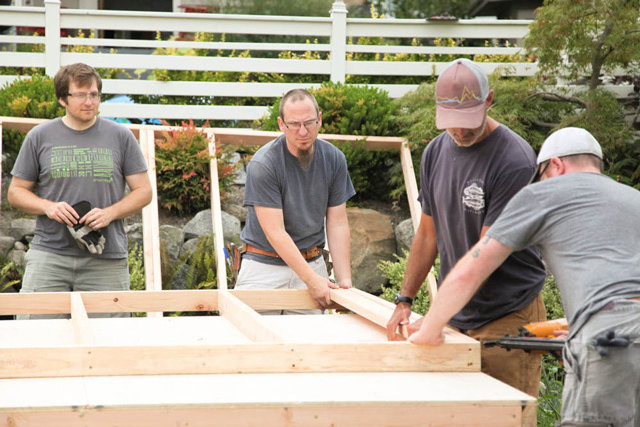 Alki Lumber provided 100% of the framing package, at a significant discount; Windows Door & More offered reduced cost doors and windows; James Hardie donated 100% of the siding and exterior trim; Mohawk donated 100% of the flooring; and numerous small personal donations came from our staff. Though the house is tiny, the construction effort is not. 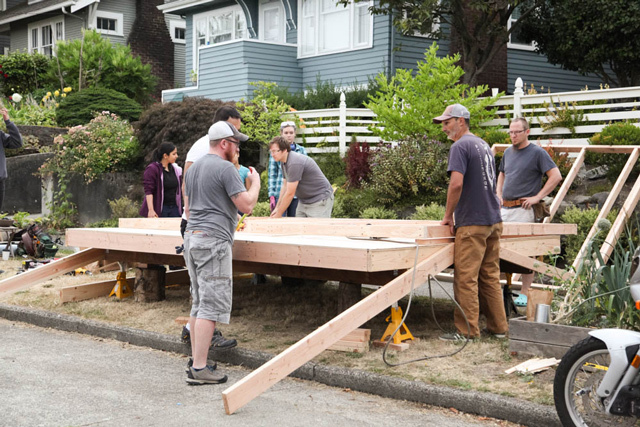 Our team of Weber Thompson staff has already volunteered over 150 hours of their own time getting us through the structure’s framing with another 200 volunteer hours still needed to complete the weatherproofing and finishing. We anticipate completing the build by mid-September, and will have the Tiny House ready for relocation to LIHI’s next encampment location. We are honored to support such a worthy cause and are immensely grateful for the donations and sweat equity that have made this project possible. Providing basic shelter for a family or individual in need, with our own hands, has been incredibly rewarding. It has inspired us to be more connected to very real issues facing Seattle’s homeless residents. 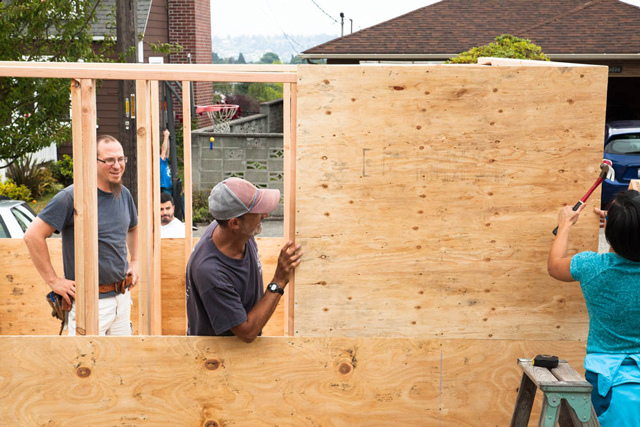 After completing construction in mid-September we plan to document our prototype improvements so that others (contractors, architecture firms, community groups) can replicate the Weber Thompson Tiny House, and provide their own shelter to someone in need. Please visit LIHI’s Tiny House site or more information, or see below for images of our Tiny House progress. – Carey Dagliano Holmes is an Associate at Weber Thompson and works in the Mid-Rise Design Studio. She is passionate about making Seattle a safe, equitable place for her family and is a member of the Southeast Design Review Board.